Deputy Defense Minister says haredi demonstrations against enlistment are the antithesis of Torah values, show lack of gratitude. 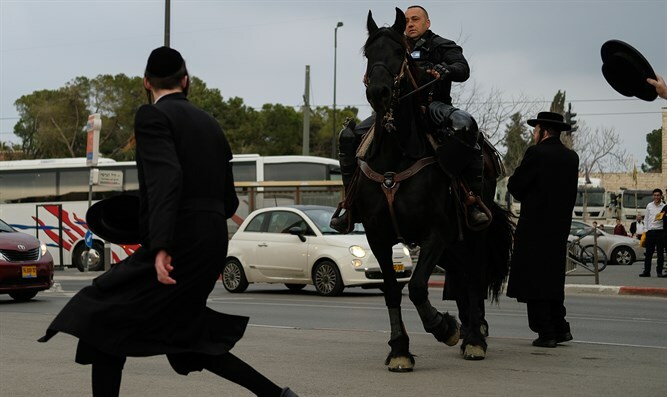 Deputy Defense Minister Rabbi Eli Ben-Dahan (Jewish Home) slammed the haredi demonstrations against enlistment in the IDF which have occurred around the country this week. Rabbi Den-Dahan criticized the ‘Yerushalmi Faction’, a Litvish movement led by Rabbi Shmuel Auerbach that is staunchly opposed to haredi enlistment in the IDF, for instigating the protests and riots, which have blocked roads, led to the injuries of several police officers, and led to dozens of arrests of rioters. "There is no decree of recruitment," Rabbi Ben-Dahan told Army Radio. "Everyone who wants to study Torah can study Torah. We are talking about those who walk around the streets and do not study Torah." Rabbi Ben-Dahan expressed his disgust with the violence at several of the demonstrations, including an incident in which a haredi soldier was attacked. "It's an attitude that shows real ingratitude. There are people who do not sleep day and night to protect you. And this is you're attitude towards them]? This is the thanks?" "They are using the Torah to act [in a way which is] contrary to it. They are trying to sanctify God's name, but they are really desecrating God's name. [They are turning] the Torah into a tool for hurting others," Rabbi Ben-Dahan continued. A video circulation on social media showed a soldier appearing to use pepper spray in an attempt to disperse protesters villifying him. A short time later, a demonstrator assaults the soldier, kicking him and knocking him to the ground. Other demonstrators then join in and begin hitting and kicking the soldier. The attack continues for several moments before passersby are able to rescue the soldier. He appears to have suffered only light injuries. MK Yehuda Glick (Likud) also condemned the violence as contrary to Torah values. “These people are connected to a Torah that is not the same as mine. They are slandering the Torah. Of course, these are outlaws who belong behind bars for a long time,” he tweeted.